Pomar Das Castanhas is a chestnut orchard established in 2005 by Serafim and Maria Amaral. The orchard is located in Waterford, California; the heart of the Central Valley and this country's agricultural hub. We pride ourselves on the fact that this is a small, family run business that strives to offer high quality chestnuts at wholesale prices. We are SOLD OUT of our fresh chestnuts for the 2018 season. We offer chestnuts by mail and the shipping price includes handling, tracking and insurance. The shipping cost is priced according to how many pounds you order. If interested in buying in larger quantities, feel free to call us at (209) 874-3237 or email us at info@pomardascastanhas.com. You can also stop by our farm and purchase them directly from us with no added shipping costs. We look forward to doing business with you! 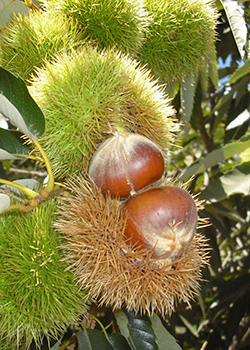 Pomar Das Castanhas is a Certified Producer of Chestnuts in California. All sales are final. | We reserve the right to refuse service.